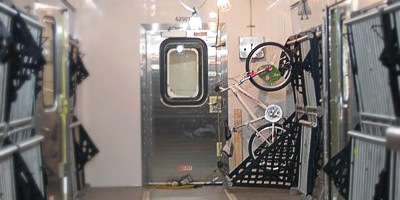 On June 17th Amtrak announced the testing phase for roll-on bicycle storage on its new baggage cars. No more bike boxes! During field testing, the baggage cars will travel to Chicago, New Orleans, Miami and along the Northeast Corridor to undergo testing for speed, stability, braking and baggage handling. Amtrak riders enjoy the convenience of seamless intercity travel and Amtrak get that. Their investment in new long distance equipment is in response to those exact needs. By the end of 2016, long distance routes will see the addition of new diner, sleeper and bag-dorm cars, making for a more modernized travel experience for our riders. “It’s clear that Americans want a national system of intercity passenger rail and Amtrak is moving ahead to build new equipment to meet customer demand,” said Amtrak President and CEO, Joe Boardman. The new baggage cars will be used on all 15 long-distance routes, which means the benefits of improved reliability and an enhanced climate-control environment for baggage will be available to long distance customers by the end of 2014 . Also, the new cars will be equipped with built-in luggage racks that will be able to secure unboxed bicycles (hooray!). Amtrak is excited for this next phase of the new equipment journey into revenue service and hopes you are too. Check back this summer for more news, photos and information on the new long distance equipment. For more information, visit the Amtrak blog.